Sharp X68000 Series 5.25in.Disk. published 27 years ago by MicroProse Japan K.K. 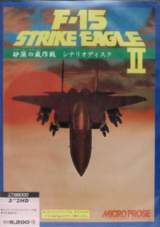 F-15 Strike Eagle II - Sabaku no Arashi Sakusen Scenario Disk © 1992 MicroProse Japan K.K. Releases on March 27, 1992 in Japan.